Patrick had driver trouble, big driver trouble. 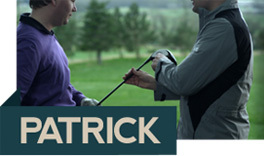 Here’s why Patrick wanted to be involved, what he hoped to achieve and how we made him a better golfer. The shaft he had in his old Titleist driver was an Aldila VS Proto 65 and has a very high torque (the tip is very soft, made the head unstable at impact leaving the strikes in the face very inconsistent and mostly heel side).This meant he struggled with accuracy off the tee and his driver always put him into trouble. Patrick could swing it quite well with plenty of energy. His swing speed was high but the old club wasted all this speed by turning over when he hit the ball and all his shots went low, mostly left and in the rough. So we needed to fix his accuracy off the tee and build him a club to help him hit more fairways. First we needed to stabilize the head so we tested a few much stiffer tipped shafts. The results were instant with him hitting the ball in the centre of the club more and the ball stopped hooking immediately. We grabbed the new Titleist 910 D3 head and screwed in a Miyazaki Kusala Black X Flex shaft with a much lower torque and stiffer tip to keep the head even more stable. We also wanted to maximise his speed so a lightweight 61 gram shaft was used, when the shaft is lightweight we can go to X Flex to get explosive distance off the driver. Once we got the ball flight more consistent off the face and with the shaft managing the swing energy more efficiently we started to see quite an big increase in distance. He hit it on average 40 yards longer (off the tee) and now arrow straight.